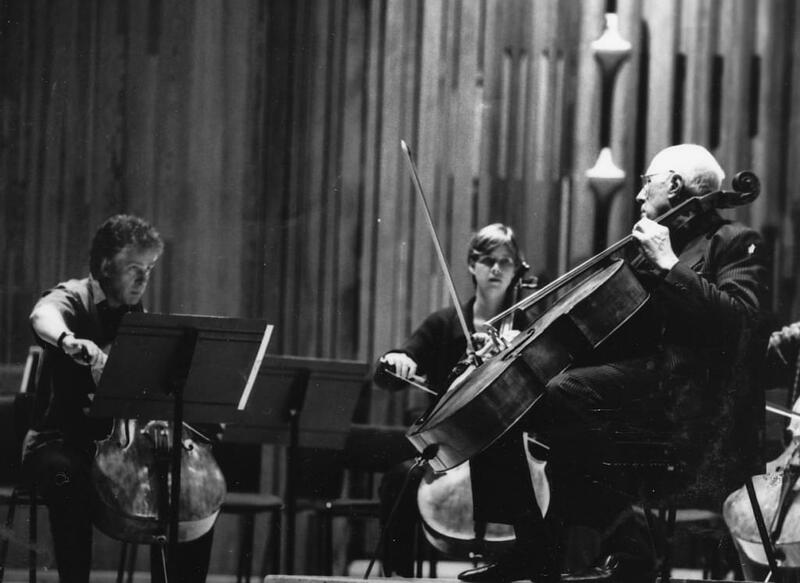 As well as being one of the world’s greatest cellists of the 20th century, Mstislav Rostropovich was an inspirational teacher, and yet he never brought his cello to lessons – he wanted students to find their own sound. 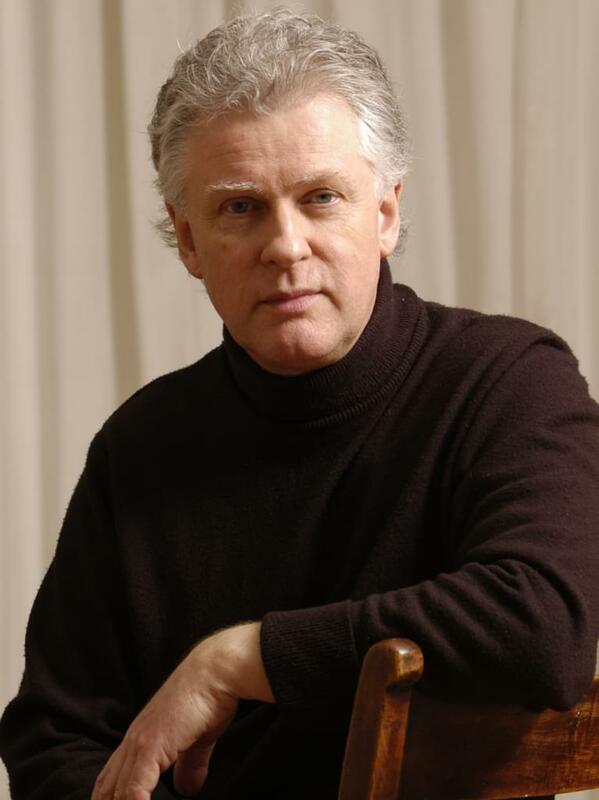 Moray Welsh, who studied with Rostropovich in Moscow, explains his teaching philosophy. The first time I heard Rostropovich was in 1962 at the Edinburgh Festival. He had swept on to the music scene around 1960 and everyone was bowled over by him. 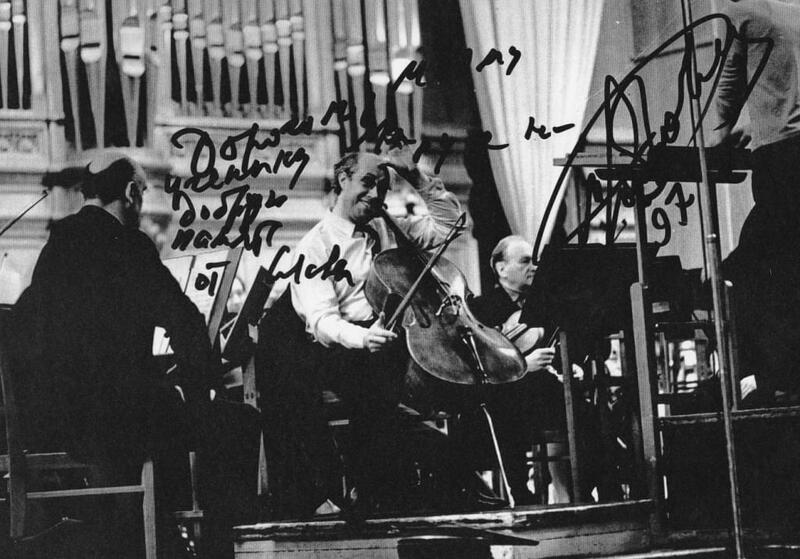 I didn’t meet him until 1968, when Benjamin Britten heard me and suggested I should play to Rostropovich at Aldeburgh. It was completely unexpected, and a complete dream – terrifying and exhilarating at the same time. I played the Haydn C major Cello Concerto to him backstage at the Maltings. He played the piano – without any music. I remember the feeling of bewilderment that I was sitting in this small room with Rostropovich at the piano, playing this piece to him. Afterwards, he said something to me in broken German, but I didn’t understand, so I asked Britten, who told me he had wanted me to go to Moscow. I had a lesson with him in his hotel room in Edinburgh. I had no idea what he would charge, so I carried a pocketful of notes. I thought he must be the most expensive cello teacher in the world, so I took £150 (this was 1969). At the end of the lesson I asked, ‘What do I owe you?’ and he replied, ‘One penny!’ I thought he was joking and asked what he really wanted. He said, ‘No, I want one penny. I’ve never seen one penny.’ I didn’t have any change so I had to go downstairs in the hotel, and brought back a penny. It was all a whirlwind, and the following year I went to Moscow to study in his class. Rostropovich never demonstrated in lessons and didn’t even bring a cello. In the two years I was there, he picked up an instrument twice – once to mimic a famous French cellist who was coming to Moscow. He didn’t want students to imitate him, unlike many teachers. Most teachers demonstrate and the student has to emulate them, but Rostropovich never wanted that. He wanted to encourage them to have an imagination about sound. The Russian tradition was well established among his students. Rostropovich used to say that anything of value he had to say came from Davidoff. The 19th-century Russian legato – the son filé – was evident in all his pupils. When I first arrived in Moscow, I thought something strange had happened to my ears, because one after the other his students came along and all had this amazing sound. I wondered how they all produced this on usually not-great instruments. It was because of this amazingly consistent legato, which lasted the whole length of the bow. Many of the Russian students had awful cellos, but they had such good instincts about how to get a good sound out of an instrument that they could make a fantastic sound on a duff instrument. They had all gone through the system from the time they were tiny, and the traditions were seamless, so they didn’t need a lot of technical information. On the other hand, I was very green and needed more help, so I worked with one of Rostropovich’s pupils, who gave me back up information. The three key elements are drawing the sound out of the string in the right place, at the right speed and with the right pressure. These were fundamental to Rostropovich’s understanding of how to produce volume of sound. Everyone remarked on his huge sound, and it was based on those three things – position, speed and pressure. The Storioni was the cello with which he made his name, and the one he loved most. He changed to the ‘Duport’ Stradivari around the time that he left Russia, in 1974, and played it for a while. The first time I heard him playing it, I felt it wasn’t the Rostropovich sound that had become so characteristic. It was slightly anonymous. He was able to sound like himself on the Storioni, but the Strad had its own character. Latterly he went back to his Storioni, and said that it was the cello he loved most. His connection with the instrument was extraordinary. You could see in his fingers what sort of sound was going to come out – he had such sensitive hands. It was the same when he played the piano: he would play everything he wanted to demonstrate on the piano and also had a wonderful sound on the piano – it came straight from his brain through his hands. Whenever he talked about cello playing it was about the character of the sound. He was interested in the variety of character that you could get out of the instrument. In his classes he would paint pictures with words to develop a sound that had some sort of character in it – ‘This sounds like the air on a really cold day,’ for example. I was conducted many times by him, as Principal Cello of the London Symphony Orchestra, and the character of the music was his raison d’être in his conducting, too. We did Prokofiev and Shostakovich festivals with him and his focus was on the range of sound he wanted, from hushed pianissimo to blasting fortissimo. Even as a conductor he could create these enormous contrasts. One of the most memorable experiences for me was performing Shostakovich’s 14th Symphony, which has a solo cello movement with soprano. From being a terrified student of his to sharing the platform with him as a colleague was an enormous journey for me and I felt nervous, but he was incredibly kind and generous, and I was very touched. Ingles & Hayday was involved in the sale of two of Rostropovich’s instruments at the Sotheby’s auction of the private collection of Mstislav Rostropovich and his wife – the soprano Galina Vishnevskaya – on 29th November. The sale also included 300 lots of furniture, jewellery, art and books. To read more information about Moray Welsh, click here.